NXB110Mobile TV RF and Baseband one-chip solution – Nexell Co.,LTD. NXB110 is a highly integrated SoC (System-on-Chip) TDMB/DAB/ISDB-T and FM receiver. This device is composed of high performance RF front-end and demodulation part in a small-size single chip. This device supports various interfaces such as I2C, TSIF, SPI, HPI and EBI2 to make interface with external devices more flexible. 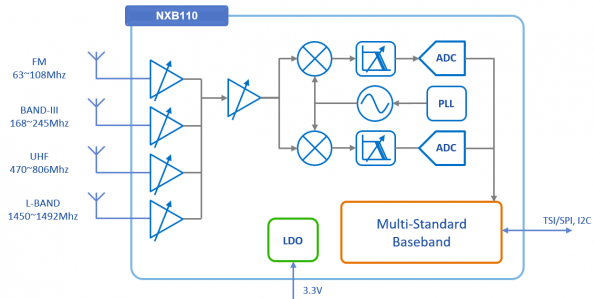 In addition, NXB110 can reduce external component with on-chip DCDC converter and LDO. With good sensitivity, high linearity, wide dynamic range, and low power consumption, NXB110 is the best solution for TDMB/DAB/ISDB-T and FM application.